Since this week’s theme is Family, why not spend some time learning about your own family history? Learning about your family history, teaching your children about the past, their ancestors and family origins can be a rewarding adventure. While researching your family tree can be a very complicated and time consuming hobby there are plenty of genealogy activities for children to do. 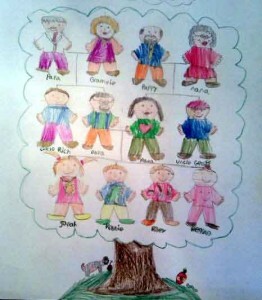 For younger children, a simple family tree poster can be lots of fun. Simply get a piece of poster board and a scrap piece of paper. On the scrap paper, draw out a gingerbread style man and woman about 3-4 inches tall (this can be traced or copied from a cookie cutter or found online). Next help your child plan out where they would go at the bottom, then their siblings, parents and grandparents. Trace them on to the poster. Once the people are arranged, sketch out a simple tree outline and let your child decorate the figures to resemble their relatives. Nothing too, too fancy, but glasses, hair color/styles and favorite colors for clothing will work. Have them label the figures with their name, and what they call their parents and grandparents – Momma, Dada, Grammi, Poppa, Nana and Pappy, etc. If the children are older, they can make smaller figures and go back another generation to great grandparents and real names. You may want to turn the poster sideways, remember family trees grow exponentially each generation you go back – 2 parents, 4 grandparents, 8 great-grandparents, 16 great-great-grandparents, 32 etc… This is also a fun activity to keep calculating the number of grandparents of each next generation until they reach 1 million! Another activity for older children would be to have them interview the oldest relative they can get in touch with. Tips and a list of possible questions can be found at this website. You can customize your own list of questions based on your child’s age and ability to conduct a longer interview. If you start to get bit by the genealogy bug while discussing your family tree with your children, Ancestry.com is the world’s largest online family history resource. You can start with a free trial and go from there. Have fun researching your family! You just never know what you’ll discover!